The weather has been froggy around here lately. First it was the mittens Dr. Steph made me knit; I saw hers and I could not resist them. I love them with a mad passion. You may wonder at me, and why not? 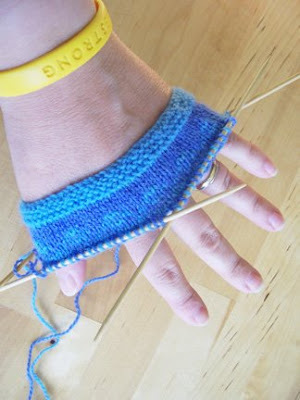 I mean, after all, it isn't mitten weather here. But I could not resist. 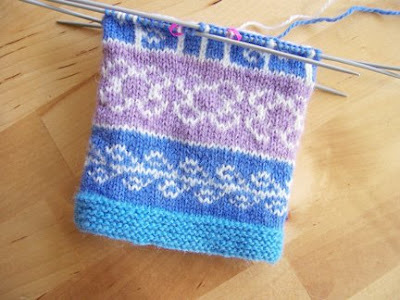 And since I don't have the time to knit a big thing like one of Anne's gorgeous creations, I figured I could take a little break with some mittens. But. Back to the frogginess. 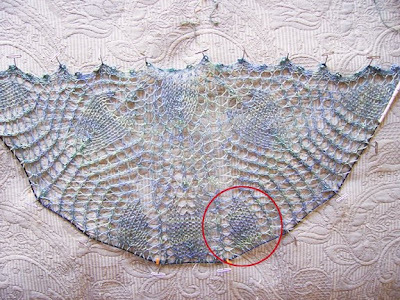 I am usually a very tight knitter, except when I have been knitting lace. So when I saw the needle size required, I figured no problem. 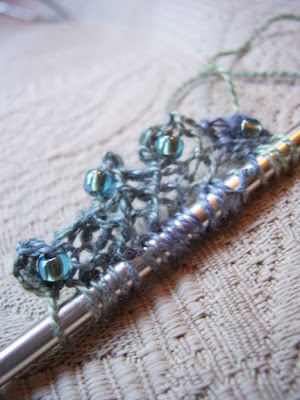 I went stash diving for the yarn and the US 2 needles and I was off to the races. Because really. Who could resist these colors? And then I realized that I was knitting mittens for King Kong. and US 0 needles. I like it much better. I am absolutely loving it now. I am so glad I ripped! I am almost back up to where I was before I ripped. Woo! I can't wait to finish. 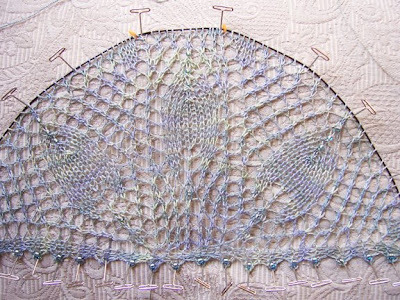 My lace projects look so horrible until I block them - it's always a pleasant surprise to me when I see that everything has turned out well in the end. 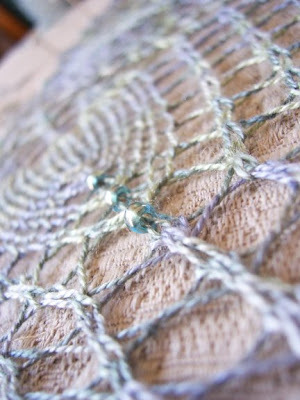 I think that's why I generally finish lace so quickly! Oh! And don't forget to get your free shipping!!! Wow Romi,I love the beginning of the new Muir! Muir was my "next up". Maybe I'll wait for this version. 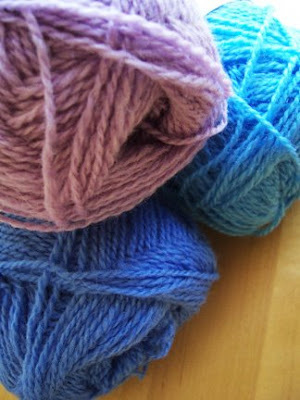 What weight yarn are you using? And the BEADS!!! Oh you are calling my name. Wow, the new version of Muir is just gorgeous!! 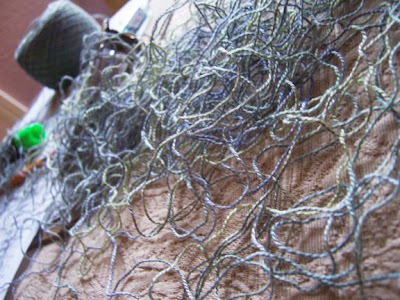 and that yarn is sooooo beautiful! Those mittens look like fun too! Isn't it funny how gauge will really "get you" every once in a while? Cannot wait to see the finished Product. Both projects are just gorgeous! I am loving this new Muir too. 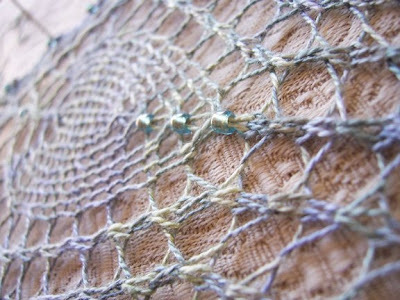 What is the beautiful yarn you're using for it. 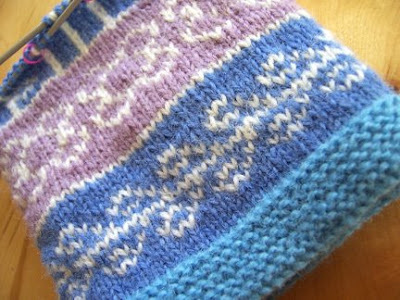 The mittens are gorgeous too I think I'll have to go look them up. Romi, those mitts are gorgeous! The new Muir is very exciting to me! Can't wait to watch it grow! that will be stunning. and i love the mittens. I love the mittens and the shawl is gorgeous.